One of the revolutions of the aquarium industry has been the introduction of Fish-Less cycling. I’m often asked whether or not “cycling aquarium without fish” is possible. Certainly! In essence, this is just simple chemistry and biology. By adding calculated and measured doses of the appropriate compounds combined with a starter culture of beneficial nitrifying bacteria, you will begin to build biological capacity for your aquarium right away. 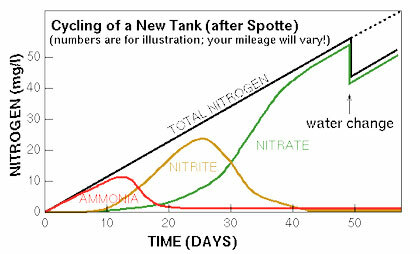 Most aquarists know about the nitrogen cycle, where beneficial bacteria convert toxic ammonia into much less harmful nitrate and are familiar with an image like the one above outlining the process. Seasoned aquarists are also familiar with “new tank syndrome” where hiccups in the development of a stable system result in sick or dead fish. For those unfamiliar, the fish’s waste is toxic to them and without biological filtration harmful ammonia will build up to toxic levels within days. Fortunately, beneficial bacteria will metabolize (“eat”) those waste products. In a series of conversions, toxic ammonia is converted to far less harmful nitrate. It is highly recommend you balance your bio-load, or the total waste products produced by all of the animals in your aquarium, with your biological capacity. Cycling aquarium without fish requires that you add the same nitrogen compounds fueling beneficial bacterial growth. A matter of simple chemistry, Fish Geeks can calculate and measure a dose of the appropriate compounds to start the cycle for your specific system. We’ll also bring along a bacterial starter culture, that will help jump start the process. More than simply adding a few drops of liquid ammonia, Fish Geeks two-step dosing process adds both ammonium and nitrite ions to turbo charge your fish-less cycling process. Be cautioned about online Fish-Less cycling how-to and DIY articles. 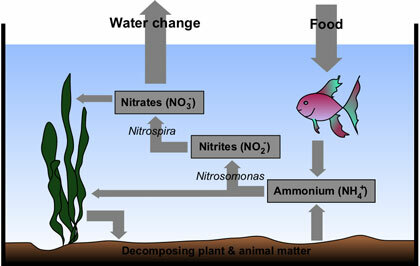 Improperly high ammonia levels is toxic to aerobic nitrifying bacteria, just as it is with fish. In addition, nitrifying bacteria prefer the ammonium ion (NH4) over the ammonia (NH3) that is present in liquid ammonia available from the store. What many people don’t know, is that you do NOT need to add fish to your tank to start the cycle. You don’t need to add an aggressive “starter fish” to your system. You don’t have to gamble on a more expensive fish. Fewer chances for the introduction of disease. More humane for the fish. Don’t lose any more fish to ‘new tank syndrome’. Stop wasting money on “starter” fish. In an aquarium cycled in the traditional manner, the aquarist cycles their new aquarium by adding inexpensive and ‘hardy’ fish. The ammonium these fishes produce as waste will fuel the growth of beneficial bacteria. As the colony of bacteria grows, your ‘biological capacity’ grows along with it. Premium bacteria colony starter package. Multiple chemical dosages to boost multiple stages of nitrification and to minimize the duration of the ‘break-in’ period. Careful chemical monitoring with pH maintenance. Call today for a quote on your system.